M.I. Hummel figurines, or “Hummels,” have been an incredibly popular collectible since their introduction by the porcelain maker Franz Goebel in 1935. It may be surprising to know that the first Hummels were not actually porcelain figures but rather paper drawings by a German Franciscan Nun and famous artist named Sister Maria Innocential Hummel (b. 1909, d. 1946). Her early works, both as an art teacher for a Catholic school as well as her private sketches, caught the eye of a Stuttgart publishing house that would release copies of her paintings of children in postcard form for sale. After viewing her postcards in Munich, Franz Goebel approached Hummel and the Convent, and was given exclusive rights to produce a line of figurines based on the young Sister’s sketchwork. By the 1940s, Hummel figurines gained popularity in the states. Of further interest was the reaction to Hummel’s portrayal of German children by none other than Adolf Hitler, who viewed the figures and sketches as ridiculous portrayals of German youth and banned the distribution of her artwork in Germany. Copyright Störfix Photo of Porzellanfabrik-Goebel_Hummelfigur. Hummels continued to increase in popularity and in 1977, The Goebel Collector’s Club was founded, bringing together collectors from around the world to discuss, trade and appreciate the many authentic Hummels that have been produced in Germany since 1935. The Hummel Company itself has changed hands several times through the years, last doing so in 2017 when Bernd Foertsch purchased the German company Hummel-Manufaktur GmbH with plans to drop annual production from 55,000 to 20,000 figurines. We reached out to the insured to gain further information in order to provide an accurate replacement value. The insured stated the Hummel was approximately six-inches tall but did not include provenance, an image, or the trademark information from the bottom. Trademark information is stamped at the bottom of all authentic Hummels and is a critical piece of information in establishing fair value. Since 1935, there have been 20 different “Hummel Marks” to help identify the time period as to when the figurine was created. The insured also informed Enservio that the piece was a family keepsake handed down to her. Armed with that information, the team made extraordinary assumptions and used a six-inch 1950’s full “bee trademark” Hummel in the #142 “Apple tree boy” form, as like, kind, and quality based on the information the policyholder shared. M.I. 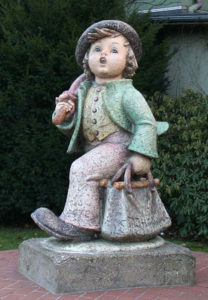 Hummel later introduced a much larger Jumbo 32-inch version of the “Apple tree boy” figure that commands a much greater vintage retail replacement value than even earlier examples of the smaller sized predecessors. It was clear from our expert’s discussion with the insured, that she did not own a monumental sized 32″ example. Since these types of “Rare” variants do exist, it’s always best to have an expert consult and gather all available facts. With this information as our foundation, we then surveyed the collectible marketplace, working with our internal and external experts to find like, kind, and quality items as described. Adjustments were made with consideration to age, condition, rarity, current market trends, availability and other variants. Based on our research, we determined a reasonable vintage retail replacement value of $250 for this Hummel. Steve Leone is a review appraiser for Enservio (www.enservio.com), a provider of contents claim management software, payments solutions, inventory and valuation services for property insurers. He has held auctioneer positions at Leone Auctions, Cole auctions, Abdou auctions, Flanagan Auction Gallery, Carver Auction Gallery and the Stutz Blacker Auction Company. His knowledge of antiques and collectibles includes estate silver, porcelain, custom and antique knives, edged weapons, antique firearms, antique clocks, antique furniture and collectibles of all types.